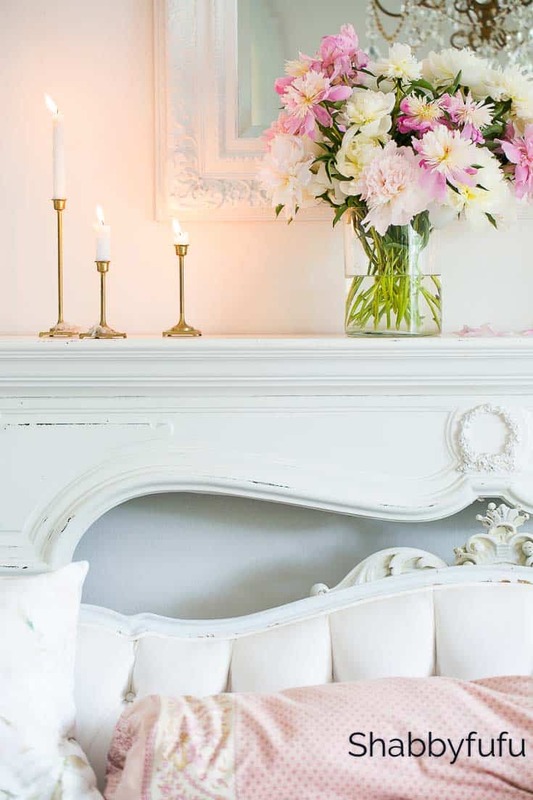 Blush pink and white summer decorating ideas are not new to my world, as I’ve always loved a good shot of romance in my home! You might think that pink is old fashioned and in a sense it can be. While it’s been used for centuries in decorating our homes, today’s pink is more blushy. Toss the Pepto pink out the window and go for pale whispering rose. It’s trending and current in interior design to go all out with a pink sofa, but it seems like that’s a bit much. I have some blush pink decorating ideas that are softer and more subtle and won’t rip your wallet apart. I’m joining in today with the Seasonal Simplicity Home Tour hosted by the talented Krista of The Happy Housie. If you’re coming over from Rachel’s place at Maison de Pax, welcome! Let’s go light and understated and this can always start with a hefty bouquet of flowers. My husband knows the way to my romantic side and bought me a big batch of peonies to start my week out right. These are some unusual peonies, don’t you think? I love the blush pink tones and put this burly bunch on the mantel as step one of my room plan. Flowers speak volumes in my decorating world. When I style flowers I love an unstructured loose and flowing arrangement. 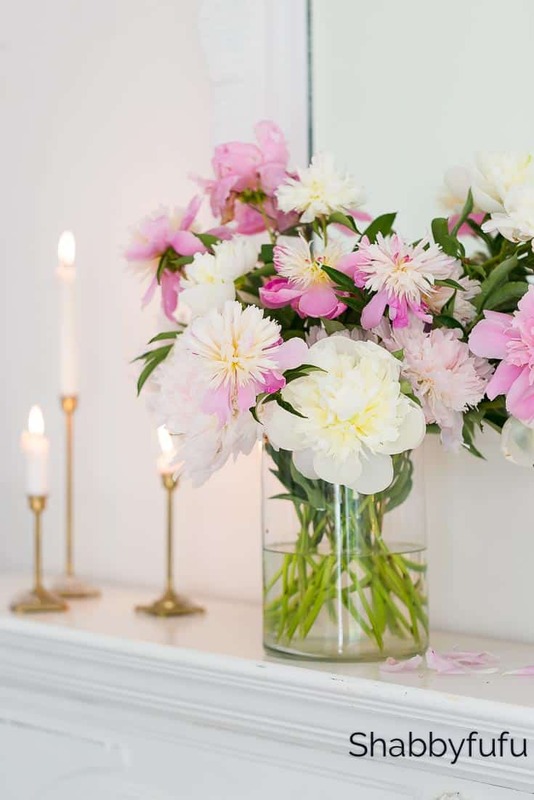 See a tutorial post on flower arranging HERE and a post on how to get your peonies to open HERE. After deciding where my flowers would go I went into my candle storage area and pulled out some favorites. With the gold chandelier that hangs in the living room, brass candlesticks pair well. The pink glow of candles on this rainy day were perfect! Less is more and for summer it seems like it’s especially relevant to a room to just keep it quietly done. I’ve been asked why the sofa is in front of the fireplace. Due to the fact that it never gets cold enough in Miami to have a fire, we are all good. Besides…it’s just a mantel that we took out of a client’s home who was remodeling and there is no firebox. A pale pink French neckroll pillow is the touch of blush on the sofa. I enjoy napping on that sofa when I can steal away from the day and the pillow is well worn and squishy. A great alternative to a sofa is to plop some big pillows on the floor or look for a daybed and dress it it for sleep! Pink and white in flowers and candles. The same tones carried throughout the room give it movement and flow. Creating flow in a room is almost like giving birth to a painting and looked on as your work of art. I shopped my house and kept in mind my blush pink and white summer decorating ideas. Then I swapped the pink bench in and took the gold coffee table out. 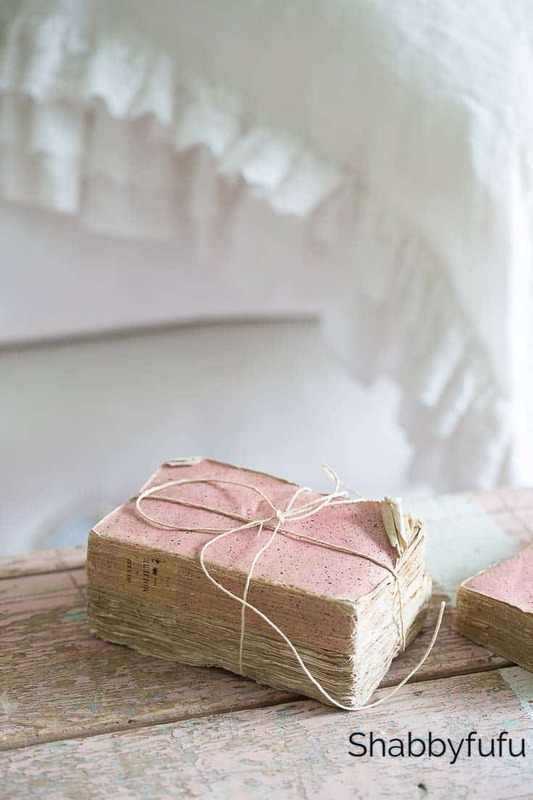 The tattered books in pink are over French and a century old and they seemed like just the perfect touch. You can make a new book old and I have a popular tutorial in THIS POST. It wouldn’t be summer without seashells and beach glass and I found all of these on the beaches down here in Florida. 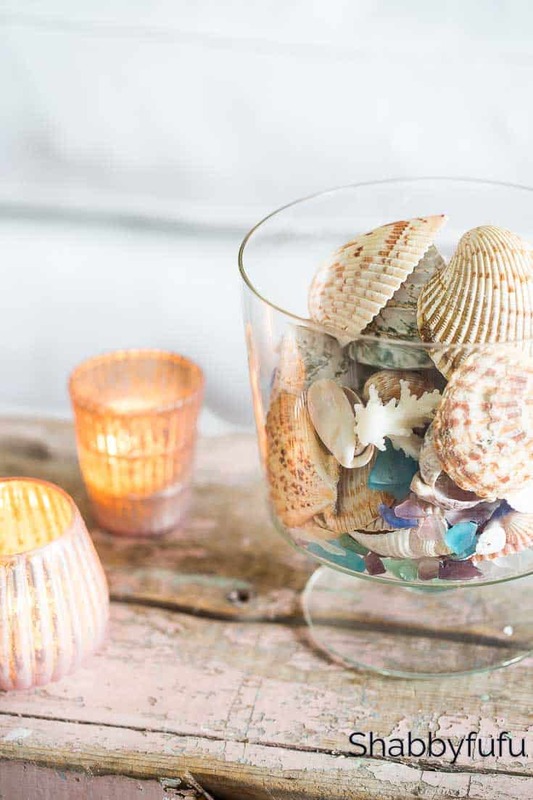 You can put past summer holiday momentos on a coffee table in a glass jar or find something beachy at the thrift. More candles in blush votives and if you have pets or small children, just be sure to keep high enough out of reach. 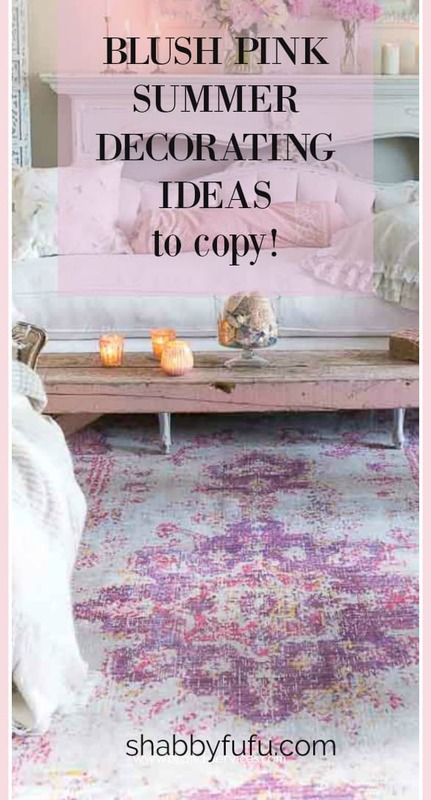 This rug has that modern pop of pink that brings it from looking staid to smashing. I love the distressed look and it anchors the room with softness. Finally, the Moroccan screens frame out the corners of the room and again I say that designing a room is like painting art! Next on our tour is sweet Abby of Just A Girl And Her Blog, so head on over and see what she’s sharing with us. If you enjoyed the post, I’d love for you to comment and share and then PIN THIS FOR LATER! Absolutely stunning, Janet! I have a weakness for pinks myself, and you’ve used them so perfectly here! Hope you have a wonderful week! Blush is one of my favorite accent colors! I have a navy sofa so I have a few pops of blush in my living room. I actually saw a living room wall painted blush in a magazine and I fell in love. I asked my husband what he thought about it and he’s completely onboard. I haven’t decided if I’m going with it but I do love blush and white! Everything that I love, shells, shabby books and pretty flowers. Beautiful photography and flowers as always! Pinning for inspiration. Hi Janet! Love the shells! I do love blush pink also and have added it in very small portions around my home. It goes really well with my aqua and turquoise colors that I’m using in my home! Such a gorgeous setting! Thanks for sharing! Thanks my friend…shells are a natural for where we live I think, and pink is just a color that I happen to love! Lots of inspiration! Love pink! Really do love the look and if I had a room all to myself it would look like this. The blush pink is so very pretty. I love this summer look. I am toying with the idea of painting my front door this color of pink. My husband is skeptical, though. What a beautiful room and the perfect place to relax. I loved the bed and also the flowers and the colors are so soothing. I may need to rethink the colors I was going to paint my bedroom. This looks beautiful! What a fun refreshing summer look! I think I might use a little of this in my own house! Pink is my favorite color so I love this idea. I like that it is classy and chic. The pop of pink is really pretty. 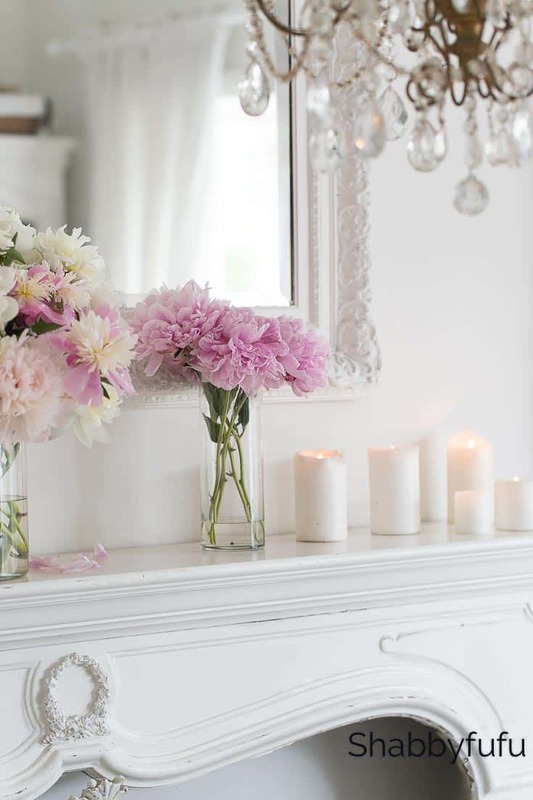 Absolutely stunning, Janet, and I love your blush pink decorating suggestions and ideas! Blush is a favourite and it looks especially stunning with all of your creams and neutrals! Absolutely gorgeous, Janet! I love all your pretty touches of blush pink — one of my favorite colors! That room is so classy and the colors are so perfect. I am a lover of red but this pink and white look will make me want to change my opinions. Such a beautiful choice of color for the summer! I think it’s perfect especially if you add in some beautiful flowers. I like the ideas that you shared! Your living room is beautiful, Janet. Love all the pink and white and I would take a nap in that space, too. Thanks Kim…it’s a comfy place to hang out in! I don’t change my whole decor for the seasons, generally just the curtains. The mantel looks nice, they are one of the reasons I’d always hoped to have a fireplace when I was younger. Perfection, Janet! I am crushing hard on blush pink right now! Loved your summer tour – so much inspiration here! Thanks so much Jen…pink is in lately and it’s great in small doses! I love the little pops of pink throughout the room. But that rug is just to die for. 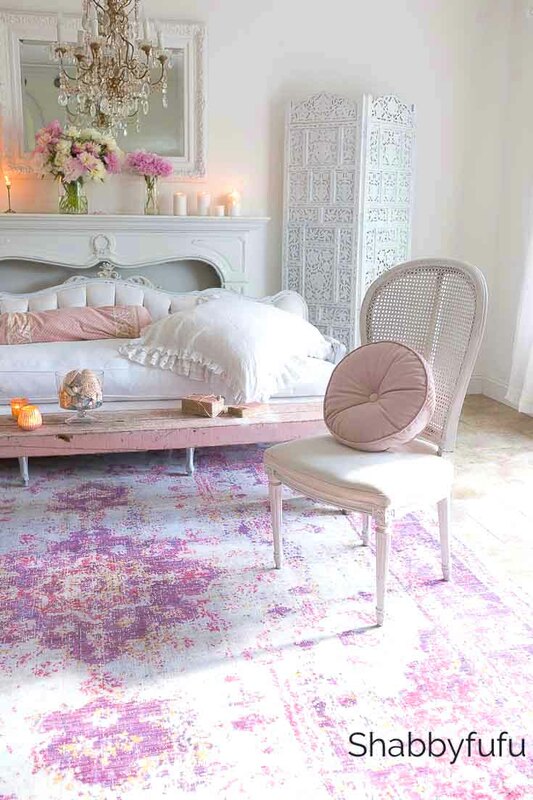 I’m not a huge pink fan but I’d use that rug. I love this rug as well and will be doing a giveaway for one on Instagram soon! The decor is stunning! Love this color combo. Blush pink and white make the perfect summer colors. Wow, I always love your home, but this is absolutely amazing. Gorgeous. Love how your living room is decorated for summer, Janet! Soooo pretty!!! Pink is definitely my favorite color with which to decorate. Thanks so much Barb…I love pink in small doses as well! Stunning as always, Janet! Those tattered books and that mantel have me swooning! Pinning! Thank you Roxanne…appreciate you stopping by and sharing! I totally can’t get enough of this lovely color scheme combination. The pastel shade of pink is my absolute favorite. I need to recreate this for my office space. 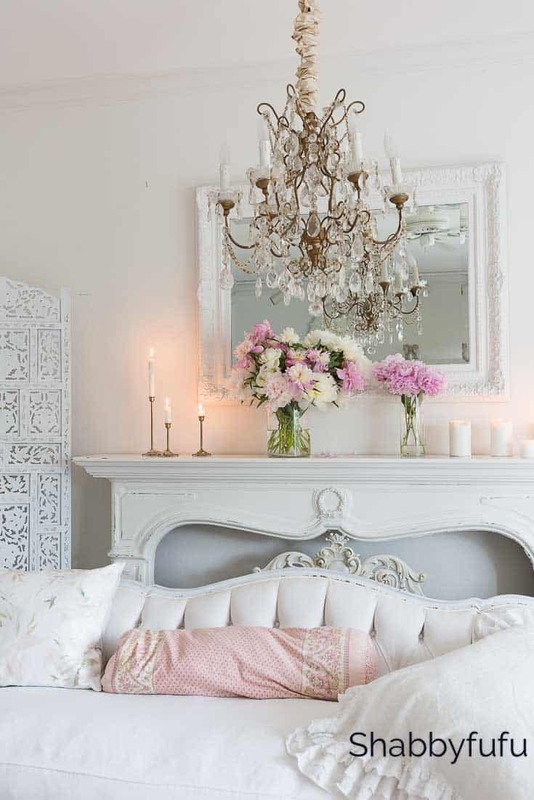 The combination of white and pink is so inviting and relaxing at the same time. Love all your home decor design ideas! Definitely the white and pink accent color is perfect match. So clean and minimalist very relaxing to look at. I’m not a fan of pink, but this is absolutely stunning. The colors and the elegance of how its all put together is great. Whenever I hear blush pink, I think of the movie Steel Magnolias. lol. I love blush! It’s so pretty. I really like the designs you’ve put together. So beautiful and romantic Janet! With a house full of boys, I’m always drawn to pink as I don’t get a chance to use it much in our home. What a lovely space to relax in. I love your chandelier and all those pretty pale pinks. Janet, just stop! This is stunning! I want to move right in. Oh, Janet! Can I just move in with you? I hope you know that I’m your biggest fan and adore everything you do! Beautiful space! I love the pale pink’s and the neutral palate. Thanks for sharing! These are such gorgeous colours! 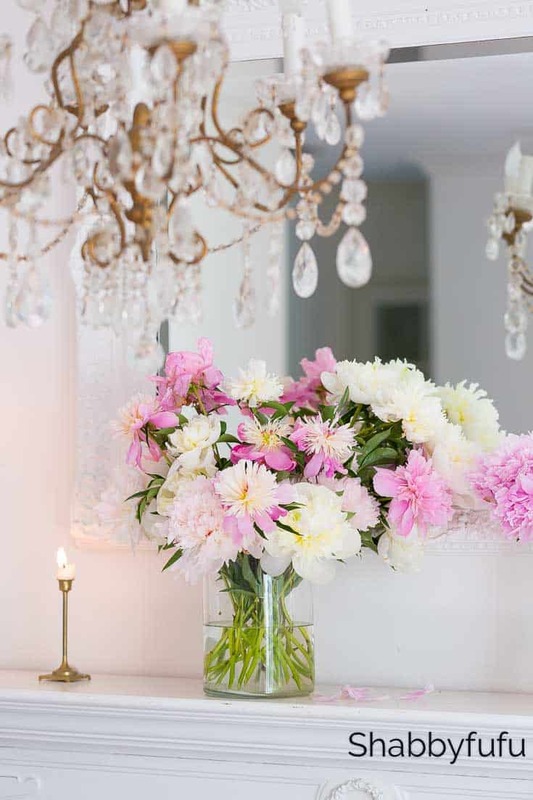 Can’t use to much pink in our house because apart from the dog, I’m the only girl – flowers are my way of sneaking in those gorgeous tones! Flowers are the best and sneakiest way for sure!